Karen and I are all about Mexican food, Tex-Mex to be more exact. We think our obsession began with tortilla chips and a local favorite, Albert’s Hot Sauce, in junior high school (more on that later). We still talk about the best shrimp dish we ever tasted during a trip to Cancun and the chicken tortilla soup we had at Disneyworld. When Karen comes to Texas, we often go straight from the airport to our favorite Mexican food restaurant in Dallas. So, when it comes to Mexican food, we definitely know what we like. In our opinion, the only thing a great salsa really needs is fresh tortilla chips. But what makes great salsa? Grocery store shelves have rows of salsa, hot sauce, and picante sauce. Chunky, smooth, mild, hot and hotter – what to choose? 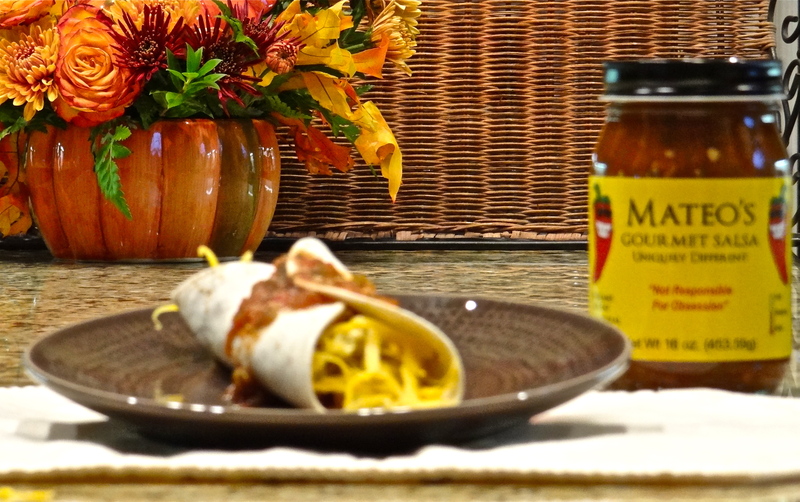 A relative newcomer in the market is Mateo’s Gourmet Salsa and it is well worth a try. Andrew Robbins grew up in Dallas and enjoyed his dad’s homemade salsa for years. He realized after trying many commercial brands that nothing came close to his dad’s recipe, so he went into the salsa business himself. After trying a jar, we can say this is seriously good salsa that would rival that of any fine restaurant. The all natural ingredients create a perfect blend of spicy tomato flavor with a texture that isn’t too thin or too chunky. The label states that Mateo’s is “not responsible for obsession”, so consider yourself warned! It comes in mild, medium, hot, and habanero. We tasted the medium and it had enough heat to be interesting, but not so much that it dominated the other flavors. It was the perfect accompaniment to breakfast tacos, one of our favorite morning treats. We don’t really have a recipe, but we’ll share our method. Wrap the tortilla in aluminum foil and warm in a 350° oven. Dice bacon into 1″ pieces and fry in a skillet until done. Remove the bacon from the skillet and pour all but 1 Tbsp of bacon grease out of the skillet. Add the potato, onion and green pepper to the skillet and cook until potatoes are browned and done, stirring frequently. Add bacon back to the skillet, then quickly stir in the egg until scrambled to the desired consistency. Place the bacon and egg mixture in the warm tortilla, add cheese and roll the tortilla. Top with Mateo’s Gourmet Salsa and enjoy! Mateo’s is sold in select grocery stores in parts of Texas and California, and is available through the company’s website, along with their signature enchilada sauce, bloody mary mix and margarita mix. Look for the chili peppers with sunglasses and big grins on the label, and prepare to become obsessed!